Wayne is the place where Aqua Kitchen and Bath Design Center is located. In the heart of Passaic County in New Jersey, less than twenty miles from midtown New York City, Wayne Township is a modern suburban community. This place is a home to Willowbrook Mall, a two-level shopping mall, the fourth-largest mall in the state, Wayne Towne Center, High Mountain Park Preserve and William Paterson University. Wayne Township has a number of lakes that include Pines Lake, Lions Head Lake, Packanack Lake, Tom’s Lake and Pompton Lake (the half of it is in Wayne). There is also The Passaic River that flows through a part of Wayne. 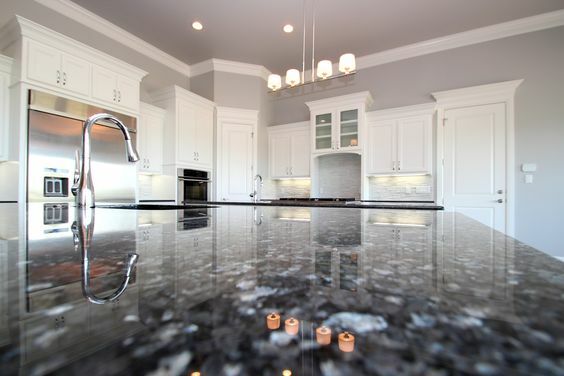 Blue Pearl Granite was the perfect upgrade and addition to this Wayne, New Jersey kitchen. With light walls and white kitchen cabinets, this kitchen needed a bit of contrast. Also, a focal point was necessary, too. Blue Pearl granite gave what was needed, providing an exceptional quality at the same time. When installed, Blue Pearl granite countertop also added an elegant touch to the overall kitchen decor. Blue Pearl Granite is one of the most popular stones in the world. This stone is a blue Syenite, a coarse-grained intrusive igneous rock, found in Norway. In the trade with natural stone, Blue Pearl is called a Granite. Blue Pearl is specifically a variety of monzonite, distinguished for the presence of beautiful crystals of feldspar. Norwegian Blue Pearl Granite is a beautiful stone that sparkles in shades of blue and gray. There are also a smattering of black and a touch of beige shade. This granite looks like it has bits of luminous pearls running through it. This makes it elegant and expensive looking. Depending on how the light illuminates, it can be viewed as a dark blue to a dark blue-gray color. This is why Blue Pearl Granite will look differently during different times of a day. 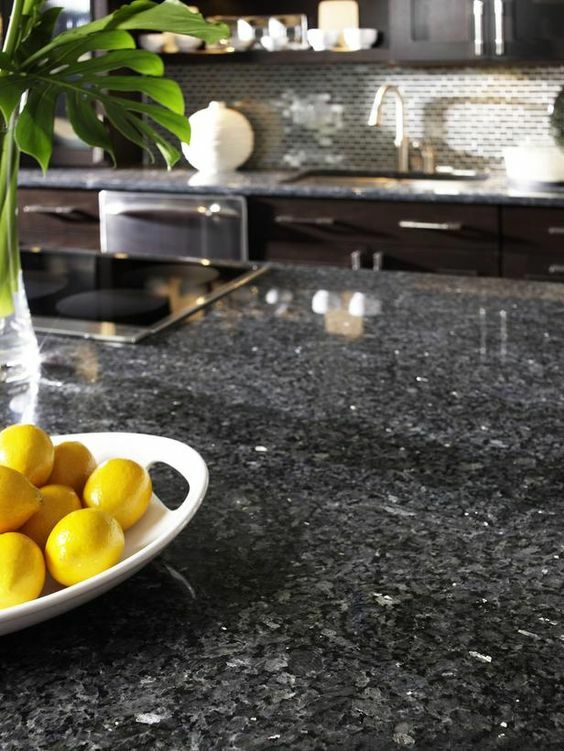 There are more than one different quarries of Blue Pearl Granite. You may see slabs in the local slab yard that range from an almost silver to a deep blue pearl. Depending on the depth and intensity of color, the price may vary. This is why you should always compare similar colors and then choose. Blue Pearl is one of the most bullet-proof granites. It requires the minimum of maintenance. Dust your blue granite with a soft cotton cloth regularly. In order to clean it thoroughly and enhance its shine, spray silicon wax once in a week. You can also apply a silicone impregnator once a year. In order to provide the best possible look and quality for their kitchen, homeowners from Wayne, North Caldwell, Franklin Lakes and other areas in New Jersey, often choose granite kitchen countertops. Our slab yard contains more than 1,000 granite slabs in over 100 colors from all over the world, including different gorgeous blue colored granites. Granite is extremely durable. It is stain resistant and easy to care for. Cost effective and long lasting, Blue Pearl Granite is one of the best choices for your kitchen. Contact us to get a free, no-obligation estimate, advice, or simply a suggestion from our designers for your New Jersey kitchen. Whether you live in Franklin Lakes, North Caldwell, Wayne, or anywhere in New Jersey, you can also take a look at our complete granite countertop selection and choose the best one for your unique kitchen design.